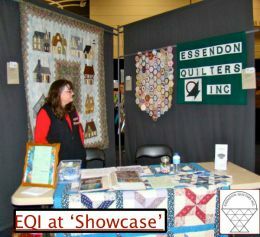 Essendon Quilter’s Inc. was honoured to be one of the Guest Groups at the 2015 Victorian Quilters ‘Showcase’, held in July at the Melbourne Convention and Exhibition Centre. The Guest Groups were provided with a section in which to display a limited selection of quilts that reflected the talents of their members. 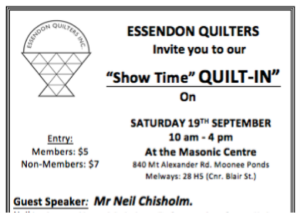 Essendon Quilters is proud to be one of the featured groups at the 2015 Victorian Quilters Showcase. Lots of sewing at today’s meeting along with the launch of the Website Membership Only section. Preparations for EQI being one of the ‘Guest Groups’ at the Victorian Quilters Showcase in July is well under way.